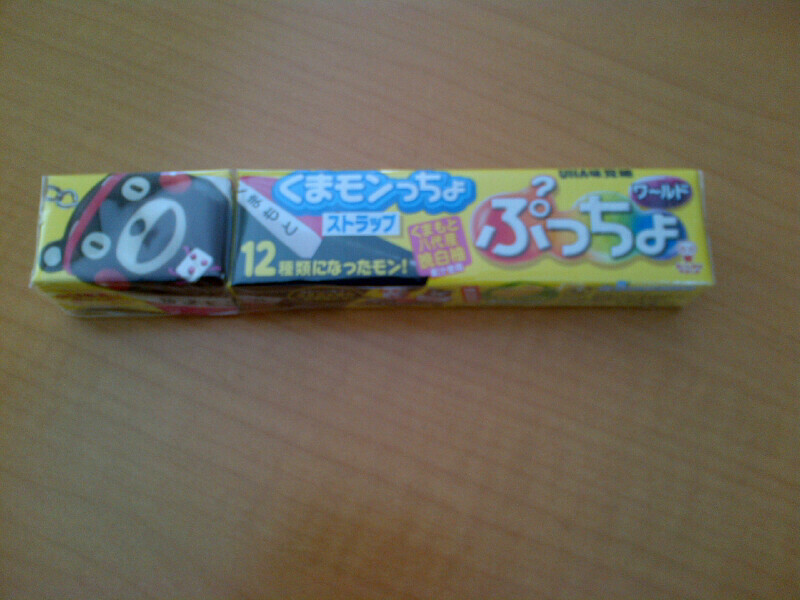 One of the more popular candies is Puccho. They are bite sized with a taffy consistency and are usually fruit flavored; although they also have soda and cola which are delicious. They are near the registers at almost every convenience store, so I frequently take a quick look to see if there is a new/seasonal flavor or the occasional ‘bonus’ item. This week the quick look paid off. The flavor of this version tastes like a combination of pineapple and mango; and, as for the free gift…a phone charm of some little bear-like guy wearing a sash. 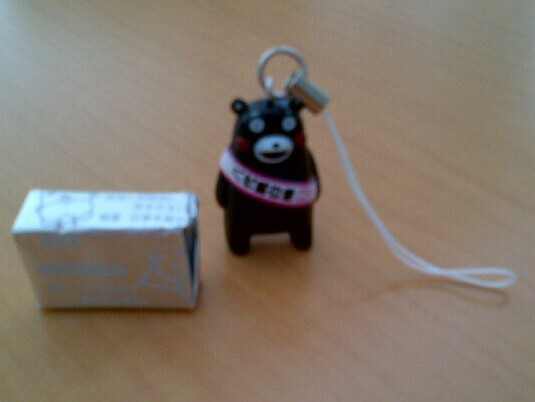 Asking around, it turns out his name is Kumamon and he is the mascot of one of the rural prefectures, Kumamoto. Why?…because every prefecture has to have a cute little mascot. This entry was posted in mike on June 30, 2013 by jules453. 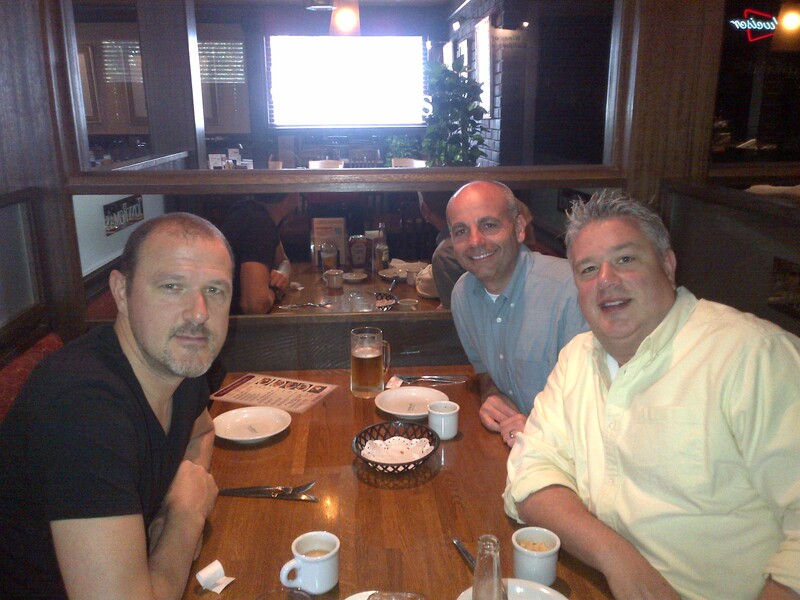 I had a dinner meeting last night in Ginza. The restaurant was a couple blocks off the main street. 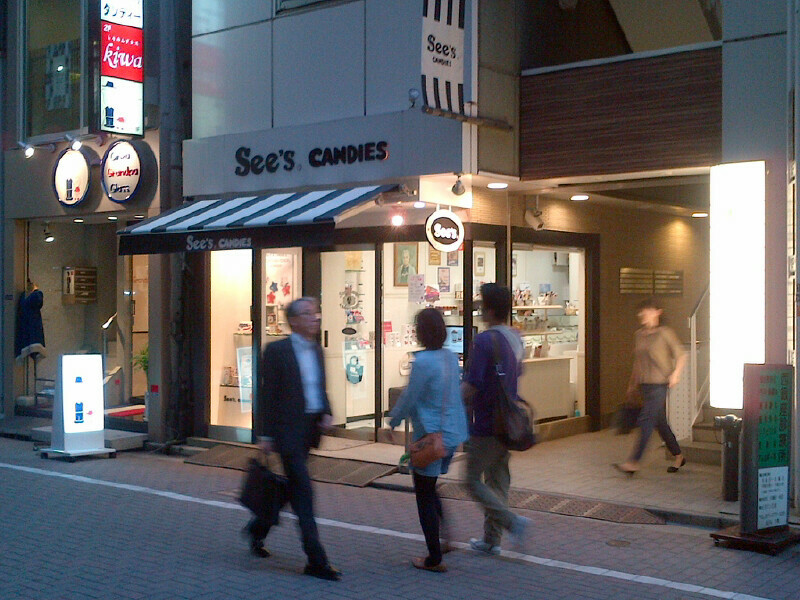 Along the way, I turn the corner and … See’s Candies! This entry was posted in mike on June 29, 2013 by jules453. Today I needed to run some errands in an area called Odaiba; which is just across the Rainbow Bridge and a little to the right. 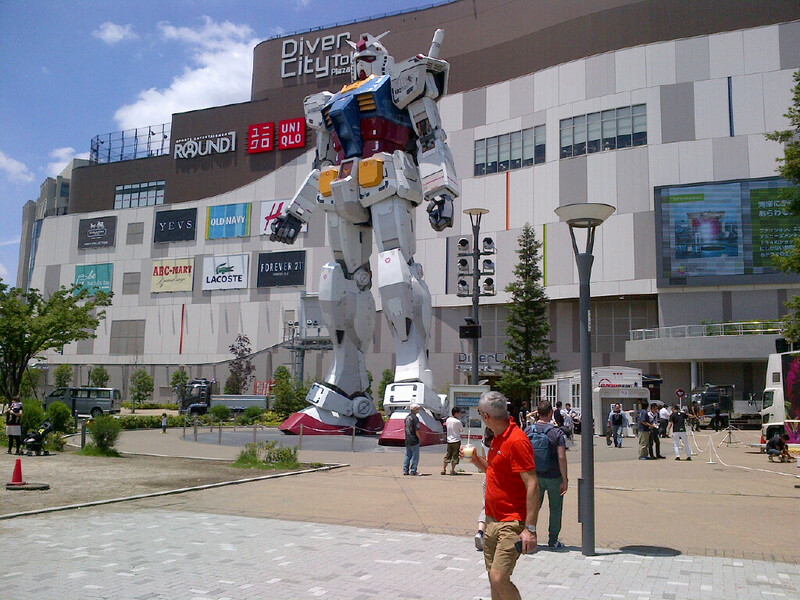 It is a shopping, dining, and entertainment area with…um…well…this guy! This entry was posted in culture, mike on June 27, 2013 by jules453. Once again, the story begins at the convenience store. 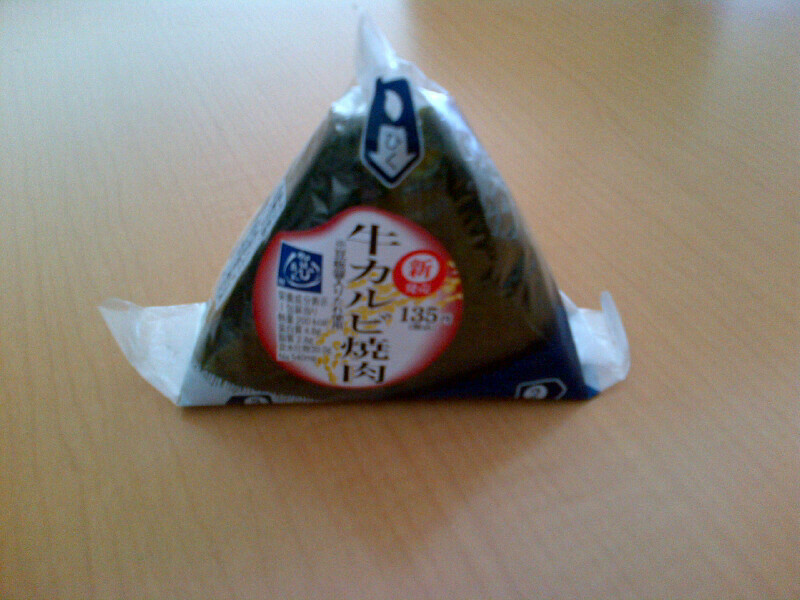 Looking for a quick snack I stumbled upon an onigiri flavor that I had not seen before (which is typical in this world of seasonal items). With no idea of what I was going to taste (a situation a little like Bertie Bott’s for you Harry Potter fans), I took a bite and … delicious! 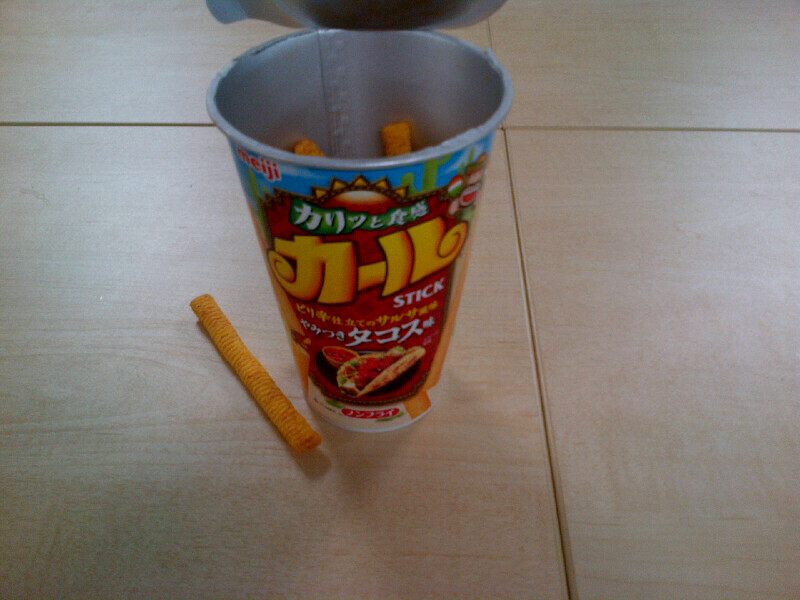 It turned out to be slightly spicy, kinda bbq meat (maybe beef?). Anyway, chalk one up on the good side of experimentation. This entry was posted in food, mike on June 21, 2013 by jules453. I must miss Mexican food more that I thought. I am almost embarrassed to admit that I found these at the convenience store and plowed right through them. Yep…behold the ‘taco stick’. This entry was posted in food, mike on June 19, 2013 by jules453. First, a quick “Happy Father’s Day” to all the dads! With the family on their way back to the States for the summer, I spent mine enjoying some good ‘ol American baby backs at Tony Roma’s in Roppongi with our neighbor and his brother (both also dads and on their own for the day). This entry was posted in mike on June 17, 2013 by jules453. 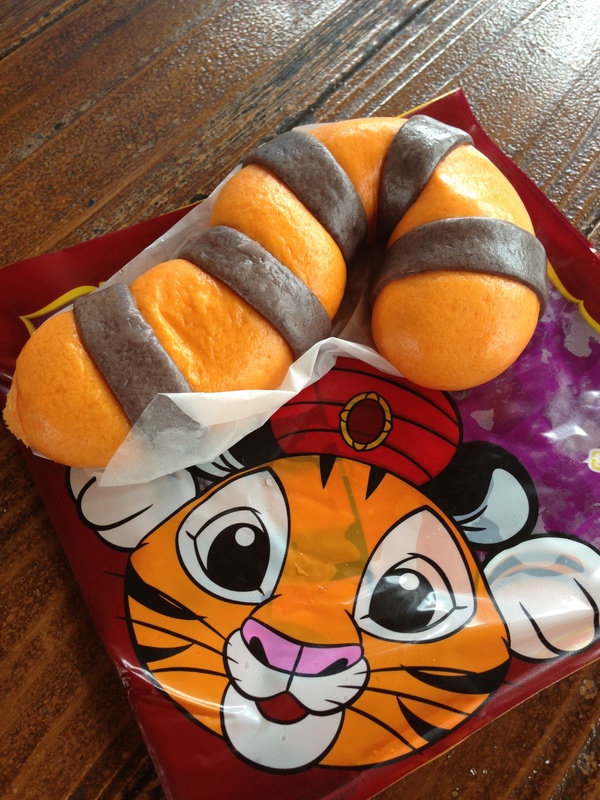 At Tokyo Disney Sea in the Arabian Coast section, there is a snack that is themed to the little tiger, Chandu, in the Sinbad ride at the park. It is basically a chicken pot pie with corn inside of dumpling dough shaped to a tiger tail. It is one of my favorite snacks at TDS. 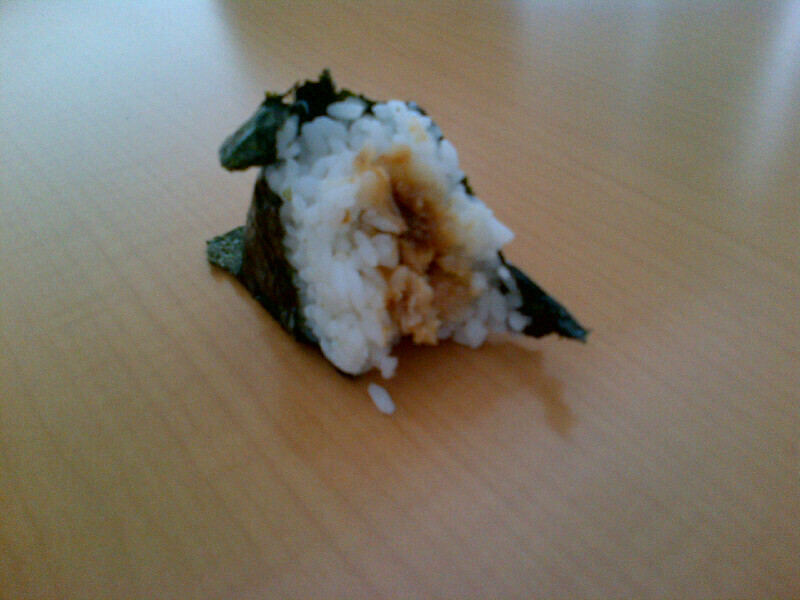 It is very delicious and wonderful-when-warm snack to share with friends or have for yourself. This entry was posted in general, meg on June 14, 2013 by jules453.